Amber Imai has always set her goals and dreams in the stars. She just finished her freshman year at the University of Hawai’i at M?noa’s College of Engineering as an Electrical Engineering major. 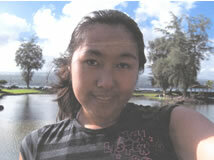 A graduate of Waiakea High School, Amber actively continues to be involved with robotics. After graduation, Amber plans to return home to either work on the telescopes or assist in the push for alternative and renewable energy on the Big Island. As technology improves, the tactics used for observing with the CFH telescope are changing drastically. Instead of having astronomers present at CFHT during observations, the goal of the OAP is to operate the telescope with no personnel on the summit by remotely controlling the telescope from the CFH Waimea headquarters. To ensure the safety of the telescope, the shutter, valves, mirror covers, and other major components must be monitored during basic operations. One way that observers will monitor the telescope is by using AXIS webcams, which provide video and audio feed directly to a website. I have set up the server to store archives of the real time and time lapse audio and video files for approximately one week. With this data archive, if something fails to operate correctly, CFH personnel will be able to see and hear what caused the problem, copy the relevant audio/video files from the archive, use them to determine what happened, and solve the problem. With successful completion of the OAP, CFH hopes to be able to fully operate and control their telescope with no personnel on the summit and still be able to ensure the telescope’s safety.